I sat down with Professor Ian Tattersall to discuss his twenty-first (!) book, The Strange Case of the Rickety Cossack and Other Cautionary Tales from Human Evolution, released earlier this month from St. Martin’s Press and Palgrave MacMillan. This fast-paced and often funny book shines the harsh light of hindsight onto the foundations of the field of paleoanthropology. It may be true that all academic disciplines, and the smart people working within them, will eventually appear naïve and at times silly to those working decades after them. But the early pioneers of human evolution and paleoanthropology appear exceptionally so. It’s understandable. The human fossil record has emerged very slowly from the earth that holds it. The remains of our ancestors are grasped tightly by caves, cliffs, and shales, earthen vaults that jealously guard their fossil treasure. These guardians yield only to the brute force of intrepid diggers. It is as though the geological processes of our earth conspired to create a (literally) stratified gauntlet as a means to reward only the worthy with tiny fossilized nuggets. Worse, the fossil treasures are granted in the tiniest possible units: a jaw bone here, a tooth there. Perhaps the most famous “complete skeleton” that has been recovered, that of the australopithecine we call Lucy, is missing nearly 60% of the bones, including most of the face, skull, and vertebrae, and all of the feet, ankles, hands, and wrists. Of course, we must count ourselves lucky to have found anything at all. Virtually nothing was known of the human fossil record until the latter half of the 19th century. The result of the very slow trickle of fossils was that the scientists who tried to make sense of them, awe-struck and deprived of proper context, made sweeping generalizations and wild speculations. In their place, who among us could have done better? Still, it is hard not to feel embarrassed as Professor Tattersall guides us through their various claims and proclamations. However, I suspect this is not the intended point of the book. 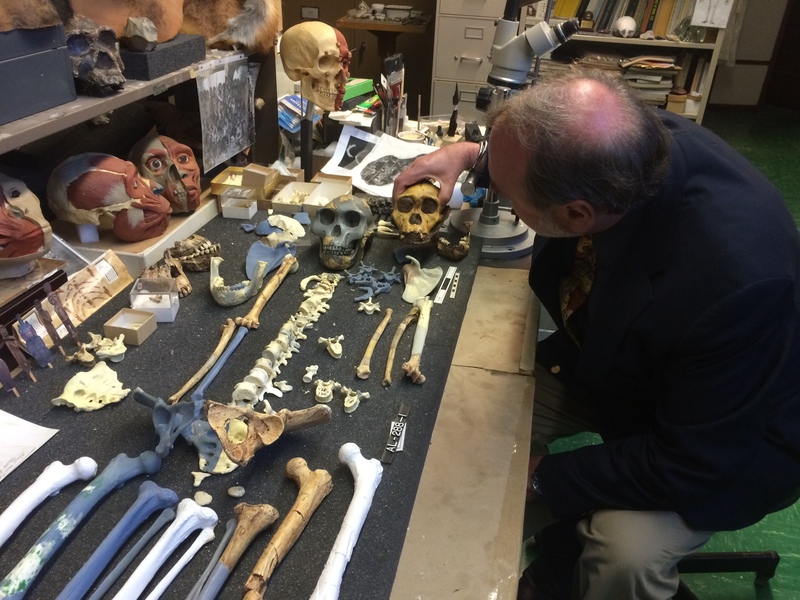 The many misinterpretations of the founding fathers of paleoanthropology were only part of the problem, and must be forgiven due to the poverty of information they had to work with. The greater part of their error was in the methodology itself. And, as Professor Tattersall gravely reminds us, some of these errors persist today. The human fossil record, like everything else in the realm of biology, makes sense only when interpreted in the light of evolutionary forces. The earliest paleoanthropologists were not naturalists; they were anatomists. As such, they were only obliquely aware of the important work going on in the new evolutionary synthesis. The nascent disciplines of cladistics and systematics, which were transforming the rest of biology, were not initially brought to bear on the interpretation of hominin fossils. As a result, the field wandered in the desert for decades. Tattersall gives us a first-hand account of this wandering, through the eyes of an eager undergraduate that mature into those of an accomplished thought leader himself. He claims to have done his best to leave out all the messy politics, which only invites wild speculation about what more drama there must have been! Rickety Cossack recounts tales of massive egos, fierce territorialism, bitter disputes, and even shouting matches on live television. We are reminded, yet again, that scientists are anything but cold robots dispassionately chasing objective truth. Every bit as unwilling to admit mistakes as politicians, and possibly even more in love with their own ideas, the famous anthropologists that we all know and admire were stubbornly resistant to consider our species to be the result of the same sloppy and meandering evolutionary path as every other. Many still are. Tattersall at work in his laboratory. The American Museum of Natural History features prominently in these stories and becomes the unlikely hero. Because hominins never made it to the American continent until fully modern humans arrived around 15,000 years ago, the AMNH has no authentic early human fossils in its collection. Only exquisite casts and reconstructions. However, beginning in the 1940s, the AMNH became a key incubator for the new evolutionary synthesis due to the contributions of AMNH curators Ernst Mayr and George Simpson (working on birds and extinct mammals, respectively). In 1972, Niles Eldridge, another AMNH curator, co-authored the groundbreaking paper formally proposing the theory of punctuated equilibrium. Tattarsall guides us through the drama of when Mayr burst onto the scene and provided the much-needed evolutionary and taxonomic perspective to the study of human evolution. This was not without conflict and Tattarsall recounts the tense drama. 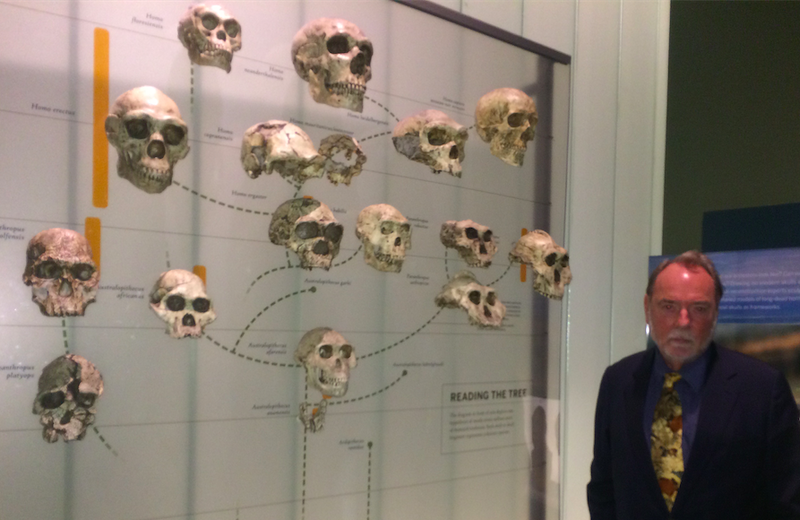 In his 2012 book, Masters of the Planet: The Search for Our Human Origins, Tattersall takes us through the last seven million years of our evolution and dissects the remarkable feat of how we got so different, so fast. Because of space constraints, he had to leave out much of the painful stories of discovery and interpretation that took place as the human fossil record first emerged. Rickey Cossack fills in that gap. Hardly a detached bystander, Tattersall does not pull punches. Ernst Mayr, the savior of anthropology from the 1950s, left one indelible mark on the field that wasn’t so positive: human exceptionalism. 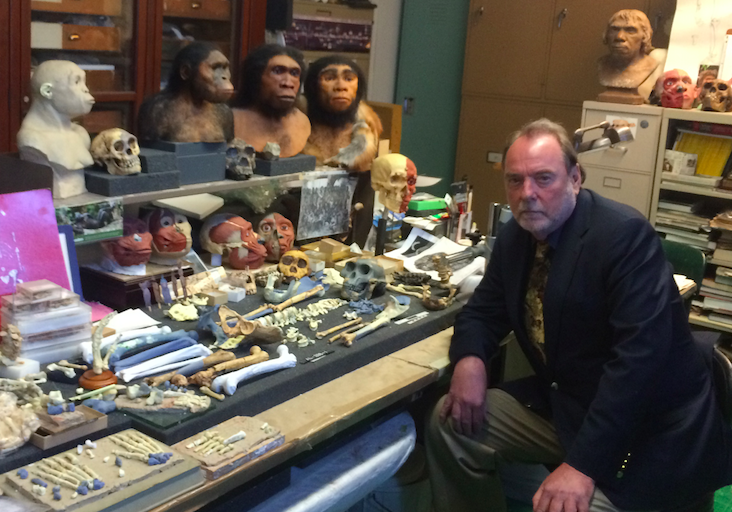 Tattersall repeatedly takes issue with a notion that still taints both the common attitude and the work of paleoanthropologists: that human evolution was a slow but unwavering march from primitive apes to modern humans, as if guided by some unseen force towards perfection. 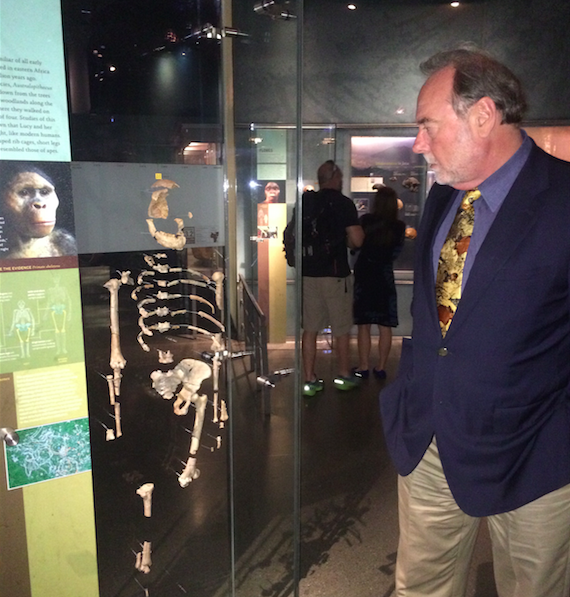 Tattersall with the hominin family tree shown in the Spitzer Hall of Human Origins, American Museum of Natural History, New York. 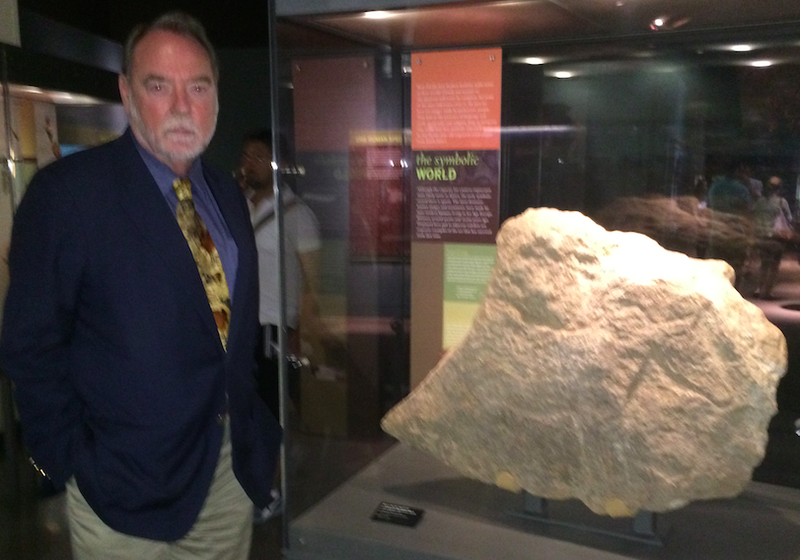 When I met Dr. Tattersall in the lobby of the AMNH, it occurred to me that he is a towering figure in more ways than one. (At 6’1”, I don’t have to reach upward to shake hands with very many people.) The walk to his office took us right through the Spitzer Hall of Human Origins, an award winning exhibition of six million years of hominin evolution. We squeezed through the throngs of captivated tourists that were blithely unaware that the tall, polite man brushing past them was responsible for much of what they were enjoying around them. Nathan Lents: As I read this book, it seems like a key audience is young paleontologists- and anthropologists-in-training. Is that correct? Ian Tattersall: Yeah, I would hope that it would be read by students and people trying to get their grips with the field. I also hope that it will be read by people who are simply interested from any perspective. We are all human beings therefore we all have a stake in our past, in our history. We all think we know something about being human just from the experience of being humans ourselves, but a lot of what we think about ourselves is actually based on questionable notions inherited from the past. NHL: What do you think is the most important lesson for young paleontologists in this book? IT: Probably, ‘Don’t take anything for granted.’ Don’t take received wisdom as the truth. All scientific knowledge is provisional. Just because you were taught that things were a certain way in your introduction to the field, doesn’t mean that they necessarily are. Question everything. NHL: In the book jacket of “Rickety Cossack,” you are described as a crotchety elder statesman. Do you see yourself that way? what are you crotchety about? IT: What I am complaining about most in this book is the lingering notion that human evolution was a process of being perfected by natural selection over long, long periods of time. It’s obvious to anybody that looks around at the behavior of homo sapiens that we’re not really perfected in any way. We have certain unprecedented powers of reasoning and rationality but we certainly are not perfected. And by extension, we’re not programed to be any specific kind of creature. And so the idea of human evolution being the story of the hero battling against the elements to ultimately triumph is an appealing one and is the stuff of folk tales since records began, but it does not accurately describe what happened in human evolution. NHL: You have written so many books and you just keep continuing. What do you find that you get most out of writing? IT: When you sit down to write a book, you have to discover what you think about every single thing you’re writing about. On a normal basis, you don’t. From day to day, you’re not always thinking about the big picture of things, nor the myriad details that come up when you’re writing a book. NHL: Did you discover something about your own thoughts while writing this book? IT: Since this book is sort of an account of the way my own thoughts developed, not so much. I wrote it as a companion to another book, called “Masters of the Planet,” which is not a title that I particularly like, but really was my attempt to try to understand how a rather atypical, in many ways, run-of-the-mill ape, managed to transform himself into a human being in 7 millions years. And in that book, I had to confront a whole lot of questions that I would never otherwise have had to face. IT: What the nature of the transformation was. What was it that made humans so different from the rest of the living world because there is a cognitive discontinuity in the way in which we reconstruct the world in our minds rather than simply react [to it]. I can’t claim to have reached any definitive conclusions or anything particularly profound. NHL: You begin and end this book with lessons learned from your study of lemurs. I think many non-specialists and non-biologists would fail to grasp why studying lemurs is useful for human evolution considering they are about as distantly related a primate as you can get. How would you explain why studying lemurs is so important for understanding our evolution? IT: Well, from my point of view studying lemurs made me realized that the norm in nature is diversity. That the evolutionary history of any successful group of organisms tends to be one of diversification. It tends to be one of experimentation with all the potential that is inherent in being a creature of a certain kind. This is the normal expression of evolutionary histories among organisms and that this notion of gradual change toward a more perfected condition is not. Lemurs have gone in all directions. People who are trained in paleoanthropology normally come out of the human anatomical tradition. And human anatomical tradition agonizes a lot about the minute variations that you find among individuals within the species. They don’t care much about the larger systematic context within which we exist and the lemurs, who are related, although, as you say, not very closely related, are a wonderful example of the fact that the norm for any successful group is towards diversification and towards variety. You can’t know anything about the lemurs at all without recognizing this. It’s the first thing that strikes you about them. NHL: And where do you think we went wrong most by not appreciating that? IT: Humans are not an exceptional group as Ernst Mayr told us they were in 1950. I mean one of the big problems was that the human anatomists who founded the field [of paleoanthropology] basically had no idea of systematics. They had no ideas of evolutionary process. They were handed fossils that they pontificated about and that was it. And they wound up baptizing them with many, many, many species and generic names. Ernst Mayr came along in 1950 and told them they were completely wrong. He got away with it, not only because he was a very respectable authority in evolutionary theory and systematics, but because the paleoanthropologists I think realized that they really didn’t have a theoretical leg to stand on. The problem is that Mayr went too far and told them that there were really only three species in the entire human fossil record and they were in a line from Austrolopichtecus to erectus to sapiens and that transformational process was all there was to it, and they fell for this. He sold one lineage, three species, successively transforming one into another. NHL: And those three represented a process of steady improvement. IT: Well, yeah implicitly. Implicitly improving anyway, over time. And I think the paleoanthropologists to whom he preached were so acutely aware of really not having any theoretical justification for what they had previously been doing, and so they capitulated and became like zealots. They had the mentality of converts. And they took Mayr far too seriously. Mayr tried to do the same thing in his own field of ornithology and the ornithologists said ‘enough of this already’ and went off and developed other species concepts and things that fit better with what they saw in nature. Paleoanthropology didn’t do that. So, we are still saddled today with a modified Mayr-ian version of the world, modified as minimally as possible to accommodate these facts, the range of new fossils that have been discovered in the last 60-70 years. NHL: So it’s easy to spot the shortcomings in science done decades earlier, but what about science now? Do you ever get the sense that, when you’re looking around, that ‘there’s no way it as simple as this’? Even though this is the state of the art; this is what everybody believes; it just can’t be and one day we’ll see this as very misguided. IT: You always have this suspicion, and you know that you don’t have the last word, and that is what is so cool about science. You’ll understand this perfectly: in science you don’t have to be right to be doing something useful. If you are a physician diagnosing a disease, if you are an Engineer building bridges or something, you better be right because the consequences are pretty bad. But if the best thing that you do is to piss off your colleagues and get them working to prove that you’re wrong and succeeding in it, you are still valuably participating in the process. It takes a bit of the responsibility off your shoulders. It gives you a bit more latitude to be imaginative. I think that’s the great thing in science. But what I will say is that, when I look back at what we believed 45 years ago… it looks very quaint and naive now. You are impressed by how little we knew. And I can only conclude that in another 50 years, what we believe [now] will look equally quaint. NHL: Last question, I gotta ask, what is your favorite piece on display at the AMNH, the thing you most love to show people? IT: The thing I’m really proud of in that hall is one piece of Ice Age Art. It’s about 25,000 years old. It’s a very deep engraving of a horse. And it’s there in the hall and it’s the original. It’s the oldest work of art in New York City. And it’s quite something to behold. Tattersall with the oldest piece of art in New York City. To find out more, I highly recommend reading The Strange Case of the Rickety Cossack and Other Cautionary Tales from Human Evolution.